Recovery from Borderline Personality Disorder (BPD) will be one of the hardest things you’ll ever do. It will require a lot of perseverance and focus…and Mindfulness every waking hour. It will require great effort to gain control of out-of-control emotions, behaviors, and thought processes. Then it will require great control to MAINTAIN control over time. You’ll have to want recovery more than anything else in life. Just like the alcoholic…to recover they have to want recovery more than anything else in life. You’re attitude will have to be “Recovery is my #1 priority” and then you’ll have to act in ways to make it so. The question of how to recover from BPD was posed to me and I wrote a couple paragraphs to give the person an idea of what it would involve. 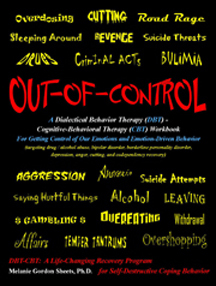 I did not spell out a comprehensive treatment program, just an overview of some things it would involve. BPD is a severe personality disorder that requires a comprehensive treatment plan and years of therapy…and years of practicing new behaviors and skills to undo and change years of dysfunctional responses. So consider the following information to be an overview of the process and know there’s more to it! Practicing life-enhancing coping skills to replace self-destructive ones…and using these in the heat-of-the-moment…and on a day-to-day basis to keep negative emotional levels as low as possible. Challenging self-destructive Emotion-Driven Thoughts with Rational Mind thoughts. Rational Mind thoughts relate to the unchanging TRUTH and facts about a situation, our life, other people, etc. Our Emotional Mind thoughts are based on our “in-the-moment perceptions”…or the way we think about things when we’re in an emotional state. For instance, when we’re upset, we may think and say, “Nobody cares about me.” This will be a habit…so we’ll have to catch ourselves (Mindfulness) and turn on Rational Mind and say, “Many people love me and care about me. I’m just thinking that because I’m upset right now. That’s just stinkin’ thinkin’” If we think, “Cutting would help me to feel better.”…we must catch ourselves and say, “Cutting helps in-the-moment, but it ends up causing me more pain and problems. Calling a support person and working through the moment will help me NOW and in the future. Cutting is relapse for me and will only bring me down and land me back into the Cycle of Suffering. I want recovery and I’ve got to use life-enhancing coping skills.” Wise Mind is already kicking in and will be offering some suggestions for getting through the moment. Another thing to think about is that it is normal to be “abnormal.” Most people have issues and concerns that bother them. Some struggle to get better n’ better…and others remain in denial and blame others, avoid their issues…and remain in a Cycle of Suffering.